This is the latest addition to Alex’s formation and a popular inclusion to the Silver package. 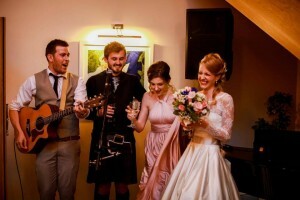 This packages includes a live performance in betweeen the wedding breakfast and the evening reception, a part of the day which can normally be a ‘lull’ in the day. This set normally takes place in the bar area of the venue or if the weather is kind enough, outdoors whilst the main evening reception room is being turned around by the venue and your DJ / evening entertainment is setting up. Alex refers to this set as the ‘pre-party’ and will try and keep this section upbeat with the hope to keep your guests dancing and singing along ready for the night ahead. This feature is only available with the Silver Package as Alex is required to be involved in the setup for any evenings entertainment package. Here are some videos from weddings including the silver package that demonstrate the early evening performance. Special thanks to Roland of RT Productions Wedding Films for these clips.